The new album from Manorexia is out now on John Zorn’s Tzadik label. 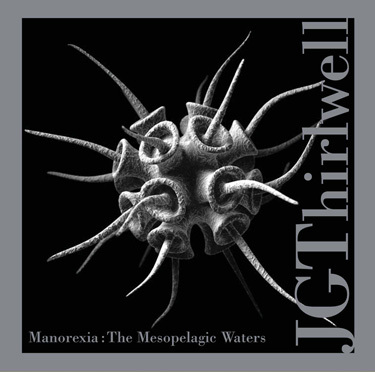 Entitled The Mesopelagic Waters, the album is 50 minutes long and contains eight tracks, radically rearranged from the first two Manorexia albums. You can order the album here. It is performed by the chamber ensemble version of Manorexia in the arrangements that JG has been performing and perfecting over the last couple of years. The album features the playing of David Cossin on percussion, Leyna Marika Papach on violin, Elena Moon Park on violin, Karen Waltuch on viola, Felix Fan on cello, David Broome on piano and JG Thirlwell on samples/keys, compositions.It was recorded and mixed at Eastside Studios in NYC and engineered by Marc Urselli. Yet another Manorexia album will be released toward the end of 2010. As yet untitled, this studio album of all-new material will be released in stereo and 5:1 surround sound.